Monash Health will benefit from additional safety measures to reduce and prevent violence through the second round of the Andrews Labor Government’s $20 million Health Service Violence Prevention Fund. The Andrews Labor Government is removing the dangerous and congested level crossing on the South Gippsland Highway to get people in Melbourne’s outer South East home safer and sooner. 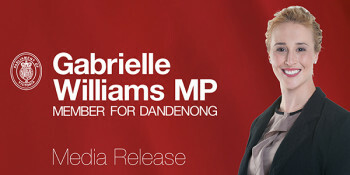 Member for Dandenong, Gabrielle Williams, today announced $700,000 to help tackle youth crime in the Greater Dandenong area. Businesses impacted by the closure of automotive manufacturing in Victoria are identifying new business opportunities and creating jobs, thanks to on-going funding support from the Andrews Labor Government. Doveton student, Jacob Eisho, will represent his region and Victoria on a study tour to learn about the service and sacrifices of our veterans.